Panama City Beach has hundreds of places to eat, many of which are fantastic. But Dusty’s Oyster Bar is special for quite a few reasons. This acclaimed seafood restaurant and dive bar sits at the top of any best Panama City Beach restaurants list, serving up some of the best seafood in the Florida Panhandle. Dusty’s is an oyster bar through and through, with an ambiance that will take you back a few years in time. This casual restaurant displays its numerous seafood options across a large bar top. Guests are treated to fresh seafood, including oysters and crab, off the raw bar. The raw bar is, without a doubt, one of the main features that draw people from all over to this restaurant’s tables year-round. Guests often opt for the four-variety oysters, a mix-and-match oyster special including both selections off the raw bar and cooked oysters. Guests can order dozens of oysters with a wide range of flavors like Mexi, Rocky, and Jalapeño-baked, among others. At Dusty’s, there’s enough here to satisfy any craving. For visitors who aren’t too keen on a raw bar-style dinner, the restaurant offers a varied and budget-friendly menu that includes traditional seafood and other pub fare. Some of the staples include fried shrimp baskets, gator bites, mozzarella sticks, and a number of soups, including clam chowder and gumbo. The crab claws, smoked tuna dip, scallops, stuffed crab cakes, and grouper are popular choices among visitors and locals alike. Most seafood options come fried, grilled, or blackened. The seafood adventure, a mix of many local kinds of seafood, and the oyster sampler are two delicious and must-try dishes. Guests can also request take-out to bring those oyster plates back to their Panama City Beach rentals. The restaurant is kid-friendly, with a children’s menu that has both seafood and non-seafood staples. Dusty’s has a full bar, including a selection of wine, beer – local, domestic, and imported – and hard liquor. Dusty’s has that laid-back dive bar vibe. The building is rather small, which gives it all an intimate feel. Décor includes hundreds of dollar bills dangling from the ceiling and plastered on the walls – a unique design choice that sets it apart from other seafood joints. Starfish hang in the glow of the many halogen beer signs that dot the walls. Red and white linoleum floors make you feel as though you’re in someone’s kitchen. Dusty’s is close to the Gulf of Mexico, the restaurant is a block back from the shore on the main drag – and it can get busy. At a place where the service is great and the food even better, there can be a wait during peak seasons (spring and summer). Visitors are welcomed to sit by the bar while they wait for a table. All in all, Dusty’s is a great place to have a drink, savor great seafood, and get to know the locals. Welcoming and sometimes rambunctious, this casual restaurant perfectly reflects the relaxed beach ambiance of Panama City Beach. Dusty’s is located at 16450 Front Beach Rd., Panama City Beach, FL near our rentals on Panama City Beach. Guests can park in the area and enjoy the nearby attractions, which includes a one-block walk to the beach and Aaron Bessant Park, a popular park with a large concert amphitheater. There’s no doubt that this is one of the best Panama City Beach restaurants to experience, with sea fare that will make any aficionado pleased. Dusty’s is open every day from 11 a.m. to 11 p.m., and reservations are recommended for large groups. It is right around the corner from our Panama City Beach rentals, which offer the opportunity to enjoy the beaches, local attractions, and community in total comfort and luxury. We promise you’ll love every moment you spend with us just like so many others have! For more information on a Panama City Beach vacation, contact us at 800-874-2412. 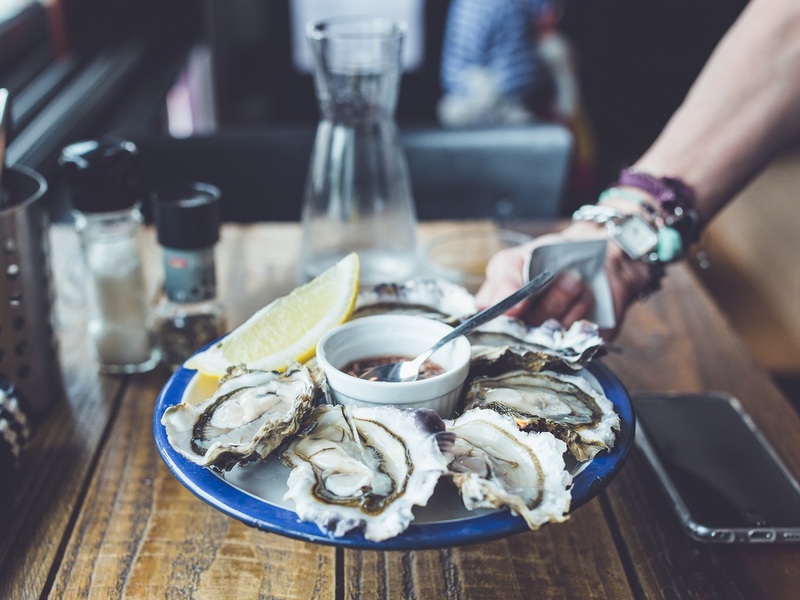 We can give you more details about available vacation rentals and how you can enjoy some of Florida’s most delicious oysters a stone’s throw away from your vacation home.